There's something incredibly life affirming about being asked for your ticket on a train and handing over a valid token for travel. The guard smiles and nods and thanks you. Your fellow passengers feel happy in the knowledge that they are amongst like minded contributors to a fair and equitable society. 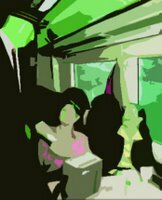 You sit cocooned in your snug, slightly too warm, slightly too crowded carriage and almost everything is right with the world. In other news, I have just ironed my Dad's blue shirt. He left it here at the weekend by mistake. There's something quite sad about ironing your Dad's shirt.